Philadelphia: Williard Johnson, 1832. Square miniature (6.5 cm, 2.5"). 16 pp. ; illus. Illustrating this miniature chapbook are 15 wood engravings. The story follows the trials of Tom — there are many threats to his small life before the spider gets him — and ends with an illustration of Tom's coffin. 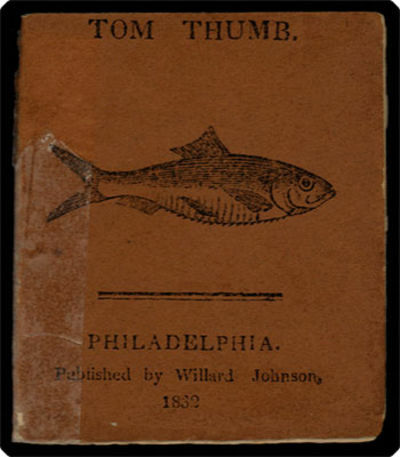 The text is in prose, with a printed alphabet and numbers at the start and a verse "Epitaph on Tom Thumb" at the end. The first and last leaves are mounted to the inside of the wrappers, as usual. This little book exemplifies an ad hoc make-up not uncommon in such productions: Completely unrelated to the story, it offers a fish on the front wrapper, a turkey opposite the title-page, a crow on the back wrapper, and a nursery rhyme about Arthur O'Bower and the king of Scots (with portrait cut of the king) inside the back wrapper — though it may be that that last is dimly connected with other contents as in this version of Tom's tale he is "born in the reign of King Arthur" and Arthur O'Bower is sometimes identified with that ancient figure!